We’re a Members’ Club, which means that the club is run by the members for the members. This helps to keep Costs down, and it also means that there is a good social side to everything we do. On flying days, we all need to help each other to get into the air, and there are lots of things that need to be done, such as holding wings, retrieving gliders, signalling, driving the winch, and so on. This means that a flying day is never boring, but it does also mean that you can’t expect to just turn up, fly, and go home, because the Club doesn’t work that way (some other clubs do, and this tends to be reflected in their costs). We currently fly regularly every Saturday and Sunday, along with ad-hoc days during the week, weather permitting. However, our planned days of opening don’t always match the English weather, especially in September and April, sometimes October and March, and occasionally all through the winter. We often open at short notice on days when the weather looks promising, if there enough members interested to make it worth while. You’re welcome to visit us on these extra days too, so if you think the weather might be good enough for flying, call the airfield between nine and ten. In the winter, though, most flights are short, and any exceptions are a bonus. The formal details about the Club as a company are on our Contacts page. We have about a hundred Full Flying members, most of whom fly regularly. They come from all walks of life, and range in age from 14 to over 80. About 15% are women, though we haven’t yet worked out why the percentage is so low, and we have a Disabled member. 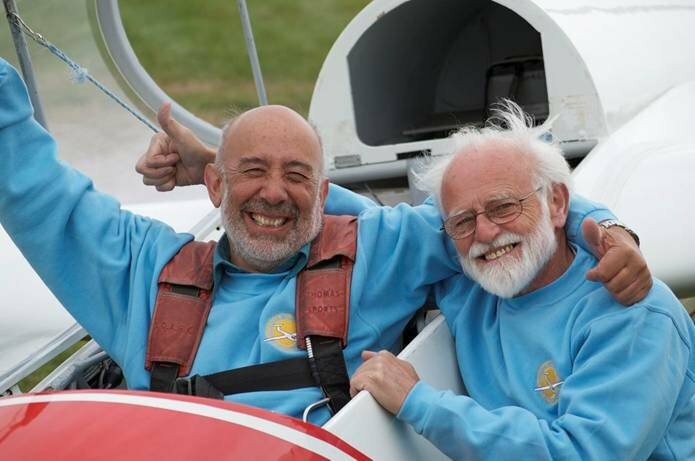 Gliding is for just about everyone who has the time and the inclination, and we welcome anyone who is interested in joining us in our favourite hobby.